Toast forms the starting point for several popular student meals, with baked beans and cheese providing two of the most common toppings. It’s easy to understand the appeal of such an easy and convenient snack – which requires the bare minimum in terms of cooking, and uses just a small number of ingredients. And of course it helps when these are also items that are easily stored and often found in our kitchen cupboards and fridges. 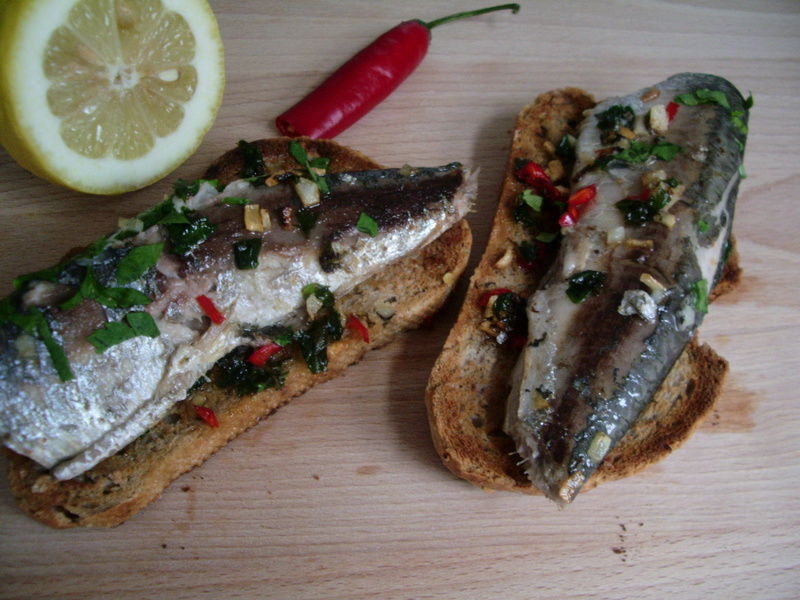 This recipe – sardines on toast – maintains many of these advantages. But it has other things to offer as well… Not only does it have a more interesting and complex flavour (the result of adding just a few extra ingredients – things like garlic, lemon and parsley), it also provides a range of nutritional benefits. 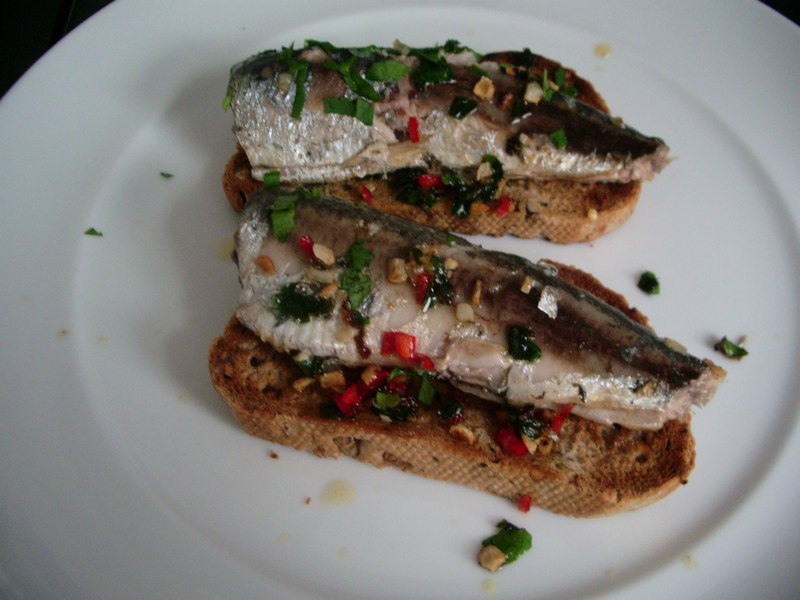 Sardines are an excellent source of protein, and also contain relatively high levels of various minerals, as well as vitamins A and D (which may be particularly relevant to people living in rather sun-deprived areas such as the UK). But as an oily fish, they are also a natural and important source of omega-3 fatty acids, which – notably – sardines retain even when canned (unlike tuna). They are also considered to be a sustainable fish (please look for the MSC – Marine Stewardship Council – certified sustainable seafood rating when you’re buying any fish), and are generally low in contaminants. And if none of that impresses you, then it might be worth noting that a 120g tin of sardines in spring water should cost about 50p from your local supermarket. If you’d like to make this into a bit more of a substantial meal, then it also goes really well with a simple fresh salad, using lettuce leaves as well as anything else suitable that you happen to have in the fridge. Put the garlic and red chilli (if using) into the pan, and cook for a couple of minutes. Add the sardines and heat through for a few minutes until warm. Stir the parsley into the sardines, add a squeeze of lemon juice, then divide between the toast and serve (alongside a simple salad if you fancy). This entry was posted in Brunch, Fish, Food, Lunch, Nutrition, Recipes and tagged fish, Marine Stewardship Council, sardines, student food, student recipes, students' favourite meals, Supper, sustainable fishing. Bookmark the permalink. wow–now that looks like a powerful dish! Indeed! And it tastes good too! I haven’t been in college for decades and still find this dish delicious! Me too, John! It makes for a particularly good lunch I think.